What exactly am I committing to? Signing up for and being assigned to a hive means that you will be responsible to make 10 total bee blocks — one for each of your hive mates — over the course of the “Bee Year” which runs January to November. You will be responsible to use your stash to make these blocks and mail the before the end of the month. You are also assigned one month as Queen Bee where your hive mates will make you the block of your choosing. One block a month is an easy commitment! How do I sign up or apply to participate? On October 28th, a blog post will be posted that contains a link to the sign up form. 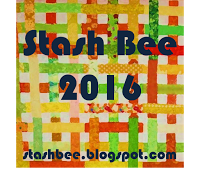 Clicking that link will take you to the Google Form for the Stash Bee 2016 sign up. There are 3 pages to the sign up form and you will get a “Thank you for signing up” page once you have successfully submitted your information. You are not allowed to sign up for multiple spots. How quickly will slots fill up? Is there a chance I won’t be able to get a spot if I don’t sign up quickly enough? Last year, it took about 3 weeks before 100 people signed up however, I do not work on assigning hives until 125 people or so sign up. This way people who change their mind about participating are easily replaced and I can put together well-matched people together in hives. Hives are assigned based on two criteria — your “design preference” (how modern/traditional you describe yourself and your stash) and your skill level. You will be assigned to a hive with people with similar design preferences and skill levels. There is also a great FAQs post that links to many other helpful posts. Let me know if you have any questions about my experience if it would help you decide if you want to sign up for next year! And while I’m thinking about things that are coming up, did you notice that the Blogger’s Quilt Festival hosted by Amy @Amy’s Creative Side will open next Friday, October 23rd? I’m going to have to put some thought into what I will be submitting! Great post Yvonne . You signing up again for next year ? I’ve often thought about joining but never do. Are tutorials provided for the block requested? Or do you have to figure it out yourself? Thanks for sharing this post. I hadn’t thought about the Stash Bee before, but I will check it out. Sounds like great fun. I’ve really loved being a part of stash bee. It’s definitely stretched my comfort zone and I’ve gotten to try new techniques and met some really fun quilters in the process. I’ve often seen posts about bee blocks but this is the first time I’ve seen a post that tells me how to sign up. Thanks Yvonne. Great post, Yvonne. I have been seriously contemplating joining a bee. The thought of being exposed to making so many different blocks is appealing – especially when you only have to make one 🙂 I’ll be giving this some serious thought over the next couple of weeks, thanks for the heads up! Thanks for sharing this info Yvonne! I love the idea of joining a bee but have never managed to get the timing right for sign ups. This sounds like a fun one, I’ll keep it on my radar for sure! Your bee blocks for the year look great, I especially like some of the early ones I’d forgotten about, so lovely to see them altogether like this.